Because Russia still applies two calendars; Gregorian – the New Calendar and Julian – the Old Calendar, the country celebrates two New Years. The new one on the 1st of January, and the old one on January 14. Naturally, they have two New Year’s Eves too. In Russia the celebration of the change of year is always grand and beautiful although the Orthodox one is not as big as the Gregorian’s. This is the new New Year for people in Russia and celebrated only since 1918. Of course a lot of things have changed since then, but something that never changes is that they always spend the evening with family. In the modern days like today, the Russians would usually stay home to enjoy dinner with their beloved ones on the New Year’s Eve. They would enjoy special dishes like caviar and herring accompanied by glasses of champagne or wine while having warm talks or exchanging gifts. At 11 PM, they would all together watch the President delivering his speech to welcome the New Year and review the country’s achievements in the past year. When the clock strikes twelve, they would wish each other good fortune and prosperity in the year to come. Then, only after midnight, Russians would leave their houses to meet friends and colleagues to enjoy drinks, more food, and festivities around the city. They would go to restaurants, cafes, bars, take a walk in the park to see performances, light shows or indulge themselves with the wide choice of snacks and drinks offered by the stalls in the local markets. A few hours after midnight, fireworks shows would begin. In Moscow it usually starts around 3 AM for thirty minutes on the Red Square. This is the biggest and most spectacular fireworks show in Russia every year, and famous not only among locals but also internationally. This fireworks show is one of the most awaited attractions on the celebration of New Year in Russia. People would disperse when it’s really close to dawn, some even stay out longer to enjoy the first breakfast of the year with friends. Olivier Salad and tangerines are the most common items to be found on the table during the New Year morning. Similar to Chinese belief, the tangerine is a symbol of good fortune. There are more dishes that specially served only during the New Year’s Eve and morning in Russia like red and black caviar, herring, baked duck and suckling pig, vinaigrette or beetroot salad, pickled cucumber, salted mushrooms, and kholodets or meat jelly. To foreigners, they may sound like having strange tastes, but to locals these dishes are delicious, festive, and must be accompanied by champagne or authentic vodka. Well, according to the old calendar of course it is not celebrated on the January 14. It is still January 1 to them who still use the Julian calendar and in English it sounds interestingly paradoxical being the Old New Year while Russians call it Stary Novy God. This holiday is not as festive or popular as the Gregorian New Year, but is still celebrated heartily and being a part of Winter Festival. It is more traditionally observed by half of the number or Russian citizens by getting together with family to have meals together and sing carols. To them who don’t celebrate this old New Year, it is a good time to meet friends and go to the clubs or restaurants especially if the day falls on the weeknight. Similar to the new New Year, Orthodox followers also celebrate their New Year’s Eve having traditional food and just another thing that resembles Chinese belief – other than the tangerine – is to cook dumplings with small objects like buttons as the filling. This is almost like fortune cookie because whoever gets the dumpling with that button inside is believed to have a prosperous year ahead. This kind of celebration is considered more intimate and calm compared to the Gregorian’s but still very meaningful. To the Russians who belong to the Orthodox Church, the Julian New Year is even more special because it marks the end of the fasting they have since their Christmas time. They would savor the delicious traditional food and drink with fellow believers in the warmest way. 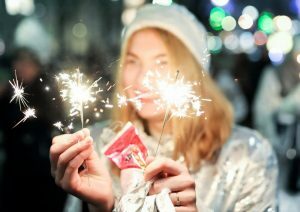 This is actually the essence of the Old New Year’s Eve to the Russians; to celebrate it traditionally and intimately, because it is more of like a “private” New Year since only very limited people observe it while the New New Year’s Eve in Russia would attract so many people from around the world. Because the Old New Year is considered more religious than the new one, many people go to churches one the New Year’s Eve to pray and reflect on what they have done in the past year and to ask for guidance in the year to come. Some churches would hold gala dinners to raise fund or go together with charity events while celebrating the change of year in a merry way. Although Russia celebrates two New Years in a year, everybody can still have fun together all the same. Each of the events may be observed in different ways but both still put forward the most important thing; to have it with family and beloved ones first and foremost. That’s what Russians do to welcome New Year’s Eve. Also, another thing to note, the marking of New Year in Russia happens nine times since the country is divided into nine different time zones. More reason to celebrate the New Year’s Eve even more merrily!